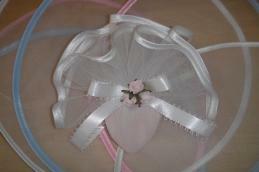 9" Tulle Rounds with HAND sewn satin borders. Price is for a package of 25 pieces. This picture is shown using two of them. 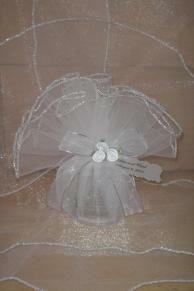 14.5" White Tulle Circles with Silver or Gold Hand Sewn Border. 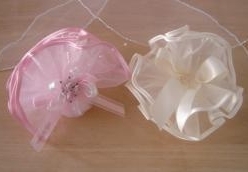 Perfect for wrapping those over sized favors and candles. This sample is shown using two of them. Just gorgeous! Price is for a package of 25 pieces. We are currently out of Silver Edge!!!!!! This netting's border is hand painted. Because each net is hand painted, each one may vary in depth, but the hue will be the same. These 9" Krystal Shadow Stripe Circles are just gorgeous! Beautiful on any favor. This sample is shown using two of them. They are packed in packages of 50. Just beautiful for any type of favor. Very Unique! �This netting is packaged in 25's. 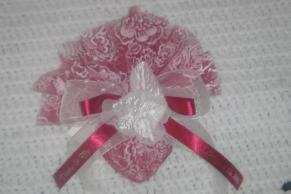 Beautiful Italian Lace cut in 9" scalloped squares. They are beautiful on any favor! 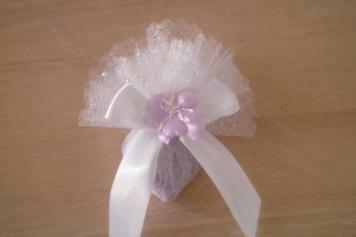 This netting is great for baby showers, birthdays, bridal showers or weddings. The rainbow colored edge goes with so many different colors! Comes in packages of 25. 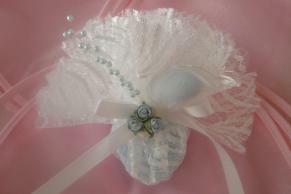 This net is so pretty for any ocassion! 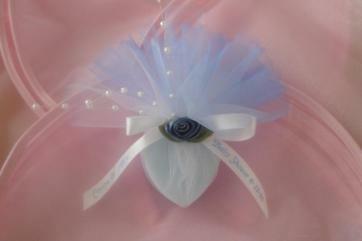 It is a tulle with a lace pattern in it. Very light and elegant. 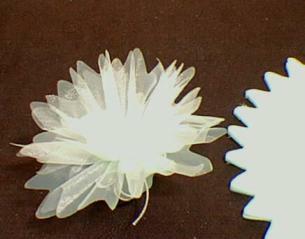 The sample is shown with two pieces. This netting is so unique and beautiful! The white floral print is painted on the silk organza. Imported from Italy. 9" Scalloped Swirl Lace. Imported from Italy. This netting is great for anniversaries, weddings, retirements, etc... We recommend using two nets for a nice full effect, like the sample shown. Sold in packs of 25. 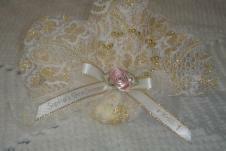 This beautiful white lace is scalloped and woven with metallic thread, either gold or silver. 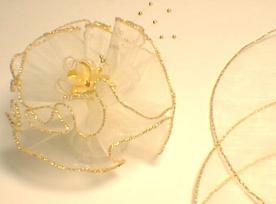 9 inch tulle rounds with hand sewn metallic border. 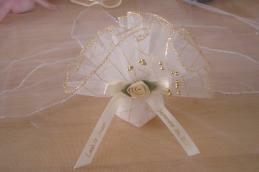 Ivory organza with a hand sewn metallic gold border. 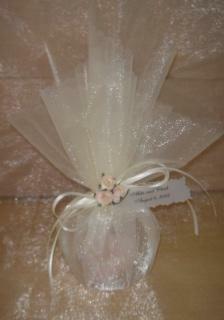 11 inch round organza with a sawtooth edge. 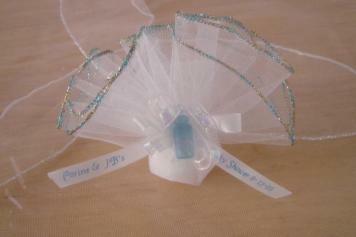 These make beautiful favors. They are approximately 9". 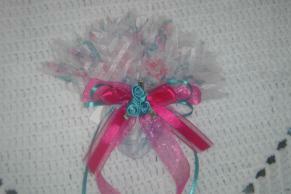 Great for decorating and for favor making. 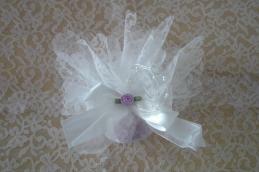 Beautiful Italian Swirl Lace with Scalloped Edge. 9 " with a hand dyed border. Depth of dyed edge varies from net to net, because it is hand done. Just Beautiful! Price is for a pack of 25. 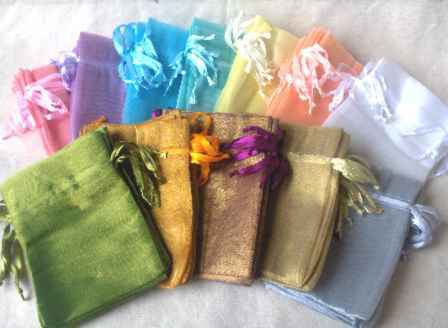 3" X 4" Organza Sachet Bag.� Makes a simple, elegant favor.� Price is for one bag.� Colors may vary from dyelot to dyelot and from picture shown.� More colors available than what is shown, please see drop down list.